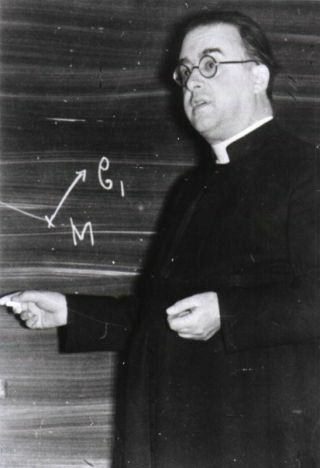 Belgian priest and cosmologist Georges Lemaître published his discovery of the expansion of the universe in an obscure journal two years before Edwin Hubble. When his work was translated, key passages were omitted. Some say it was editorial censorship. Others think it could have been a territorial scholar protecting his turf. But it turns out that the person who cut passages that would have revealed that Georges Lemaître made the greatest astronomical discovery of the 20th century was, in fact, Lemaître himself. Edwin Hubble has long been lauded for his 1929 discovery that the universe is expanding. But two years earlier, Belgian priest and cosmologist Georges Lemaître published similar conclusions in an obscure journal, the Annals of the Scientific Society of Brussels. When a translation of Lemaître's paper appeared in the journal the Monthly Notices of the Royal Astronomical Society in 1931, key paragraphs had been removed. Chief among them were the equations that described what would become known as Hubble's Law, calculating the expansion rate of the universe. He felt somewhat close to the subject, having worked on the Hubble Space Telescope for the past two decades. "I was very intrigued by it for a number of reasons," Livio told SPACE.com. "I decided to try to get to the bottom of it if I could." Variations between the original paper and the translation were first brought to light by astrophysicist Jim Peebles in 1984, but garnered little notice. Recently, however, a controversy has flared over who actually deleted the passages. In June, Sidney van den Bergh of the National Research Council of Canada's Dominion Astrophysical Observatory suggested that someone who knew Hubble could have sought to preserve his claim. Soon after, astronomer David Block of the University of the Witwatersrand in Johannesburg, South Africa, pointed out that Hubble was territorial and could have used his influence to ensure the discovery continued to be credited to himself and his institution, the Mount Wilson Observatory. Robert Smith at the University of Alberta laid the blame at the feet of the editors of the Monthly Notices. Although Livio had been told that all correspondence had been destroyed, he decided to see for himself. "I know from experience that very rarely is everything destroyed," Livio said. "I decided to see with my own eyes, to go through every document." That is exactly what he did. Livio examined hundreds of pages before finding a letter from Lemaître that clarified the matter. The letter was literally the next-to-last document he could possibly have examined. "I nearly gave up," he said. In a letter from Lemaître to William Marshall Smart, then editor of the Monthly Notices, the cosmologist said that he was sending an English copy of the paper to clear up the question of who translated it. He then went on to state that he "did not find it advisable to reprint the provisional discussion of radial velocities which is clearly of no actual interest, and also the geometrical note, which could be replaced by a small bibliography of ancient and new papers on the subject." In short, Lemaître edited his own work. His reason seemed to be based on the data used. In the original paper, Lemaître himself noted that his distant estimates were not strong enough to validate his discovery. Hubble's later paper included more detailed calculations of distance, which led to a more precise constant. Lemaître "did not feel in 1931 that he should put his name on more tentative data when better data had been published," Livio explained. Livio's findings were published in the Nov. 11 issue of the journal Nature.